Product prices and availability are accurate as of 2019-04-26 01:41:39 UTC and are subject to change. Any price and availability information displayed on http://www.amazon.com/ at the time of purchase will apply to the purchase of this product. Tac Force Karambit Linerlock. 5 1/4" closed. 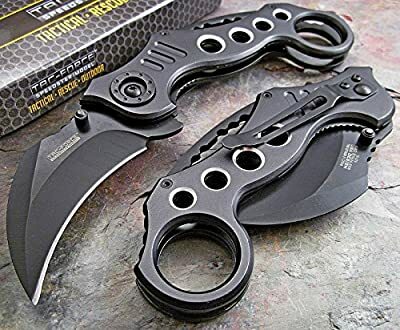 2 3/4" Grey finish stainless steel karambit blade with double thumb studs. Grey appearance alumium takes care of with combined finger hole. Black appearance stainless steel pocket clip. This knife comes brand new in box.